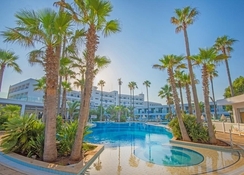 Perfectly situated on the beautiful Nissi Bay, Ayia Napa, Dome Beach Hotel’s idyllic location is a popular getaway destination for holidaymakers year-on-year. The hotel welcomes families with plenty of activities and entertainment for all ages. It’s just a stone’s throw from the nearest sandy beach and there is plenty of fun-tastic watersports on offer. Gastronomy wise, there are great restaurants to indulge in on-site, as well as places to eat, drink and shop just a short walk from the hotel. Rooms here are stunningly decorated, clean and finely furnished; the ever-popular Sea View Rooms overlook the Mediterranean, allowing you to unwind amid magnificent views from your balcony or terrace. You’ll find Greek, Italian and Japanese restaurants available within Dome Beach Hotel, in addition to four lively bars. The active among you will enjoy having the options of tennis, mini football and basketball courts while those who want to simply relax can take a dip in the pool or head to the spa. The gorgeous sands of Makronissos Beach are a just short walk from the Dome Beach Hotel, ideal for sunbathers and splash-makers. There are local shops and tavernas within walking distance from the hotel too if you want to browse authentic goods. The main downtown area of Ayia Napa itself can be reached in a few minutes by taxi, and is located about 3-4 miles from the hotel, with great shopping, amusement parks and museums on offer. Closer by is the Water World Waterpark of Ayia Napa - a great choice if you’re travelling with energetic kids! The nearest airport is Larnaca Airport, at a distance of 60km away. Each of the rooms and suites at Dome Beach Hotel boast a contemporary design. There are a variety of room types to choose from, including those with a sea view or land view, and family room options available on both. Several special request rooms are also available, including the Honeymoon Suite, the Presidential Suite and the Royal Suite – offering exceptional privacy spread across two floors, plus a living area to enjoy for an extra touch of luxury. You'll have access to facilities such as 24/7 Wi-Fi, television, tea and coffee making facilities safe deposit box and much more. At Dome Beach Hotel you’ll find several excellent a la carte restaurants serving Greek, Italian and Japanese cuisine. There are also four bars located on-site, serving late into the night. Away from the hotel, you can reach several great restaurants in a short stroll. Koralli restaurant is ideal for those who want to try exceptional, fresh seafood, while Garden of Eden is a fine-dining establishment offering a little something for everyone – also serving fine seafood dishes, Italian classics and Cypriot specialities. A great selection of bars can also be found nearby if you want to make an evening of it. 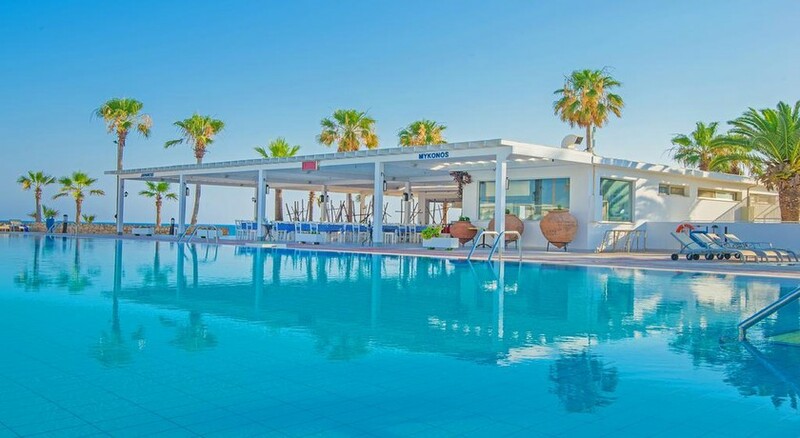 Panorama rooftop bar allows you to combine delicious drinks with amazing views over the Mediterranean and Levels Beach Bar is situated right on Makronissos Beach. You don’t have to venture far to discover great activities an entertainment! At Dome Beach Hotel there are no less than two tennis courts, a mini football court and a basketball court. There’s a dedicated children’s play area with a kids’ splash pool, a playground and Kids Club running daily activities. On Makrinossos Beach there are watersports to be enjoyed, or step it up at Water World Waterpark which offers fun for all the family. A short trip into Ayia Napa’s lively centre and you’ll find entertainment, shops and bars suitable for all ages. Cards accepted: American Express, VISA and Master Card.